Heading into Thursday night’s women’s basketball matchup at the Matadome, UC Irvine (3-22, 1-10) and CSUN (14-11, 7-4) found themselves in very different positions. Having picked up a victory over CSUN back in January, their first and sole win in conference play thus far, UCI looked to snap a seven game losing drought by completing their sweep of the Matadors in their second showdown of the year and to garner some momentum heading into a three game road trip. Rolling on a five game win streak, the Matadors were eager to keep their momentum alive as they head on a long flight to Hawai’i for a late 10:00pm tip Sunday. With a competitive first half that sent both teams into the locker room deadlocked at 37-37, the ‘Eaters exhibited an effort and a bit of promise that had carried them over the Matadors on the first time around. They seemed to be right where they wanted to be. However, CSUN showed they were not the same team UCI had beat, creating some distance in the third quarter to complete their revenge by fending off UCI, 85-77. 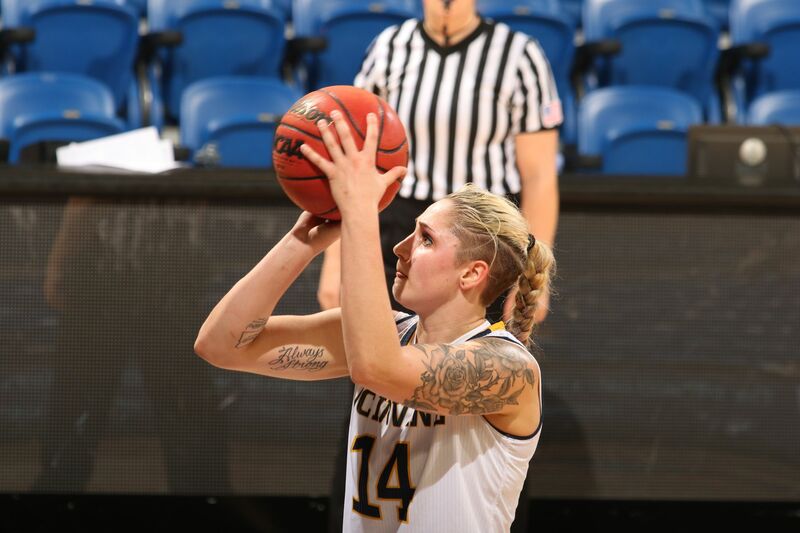 During her first conference start of the year, senior forward Brittany Glassow led the ‘Eaters’ attack and eclipsed her previous career-best by pouring in 18 points in the losing effort. Glassow went 7-9 from the floor and a perfect 4-4 from beyond the arc, both of which also mark new personal bests. Three other ‘Eaters finished with double-digit scoring as freshman guard Brooke Bayman dished out seven assists to go along with her 14 points while seniors Irene Chavez and McKenzie Piper added 12 and 10 points, respectively. After posting a modest double-double (12 points and 10 rebounds) in her first contest against the ‘Eaters, CSUN’s sophomore center Channon Fluker emerged with 27 points and grabbed 14 rebounds to dominate the paint. In fact, with UCI outshooting CSUN, 50 percent to 41.3 overall, and 53.3 percent to their opposition’s 38.3 from three, the battle was ultimately lost underneath the basket as the ‘Eaters were outrebounded by a staggering 51-22 margin. 25 of those 51 rebounds for the Matadors came on the offensive end, which converted into 32-second chance points. CSUN was first to the punch as junior guard Serafina Maulupe (19 points and four assists) drained a triple and Fluker cleaned up an errant lay-up attempt to get the Matadors on the board with a quick 5-0 start in the opening period. Piper finger-rolled a basket of her own as Chavez drained a triple to help the ‘Eaters knot the game right back up, but Fluker made her presence felt early, snagging the Matadors’ next six points to reclaim the advantage once more. Then, Glassow went on a tear. Following a lay-up at the 6:15 mark that cut into Fluker’s heat check, the Oregon native drained three subsequent triples to punch in 11 of her 20 points in the quarter alone. The last long-range bomb would give the ‘Eaters a 16-14 lead that went on to extend to 20-16 heading into the next frame. To start the second period, Chavez created some more distance between UCI and CSUN by converting two shots at the charity stripe and when a CSUN lay-in brought the Matadors back within four, Chavez buffered the lead once more with a lay-up. With baskets from Chavez, sophomore guard Andee Ritter (5 points and three rebounds), and senior forward Shereen Sutherland (eight points and three rebounds), UCI possessed their greatest lead of the game, 28-20. From there however, the ‘Eaters slowed down and saw their lead evaporate as Fluker lead a 11-3 charge that would eventually tie the game up, 31-31. Despite Triples from Bayman and junior guard Tierra Hicks, CSUN stuck around and managed to bring the game back to a deadlock by the end of the second. While the ‘Eaters came out of the half shooting an efficient 50 percent, their rebounding woes would bite them as CSUN used a 11-6 advantage to break out on a 9-3 run. UCI continued to battle and a Sutherland lay-up would tie the game at 46 a piece. On a Maulupe triple, however, the Matador’s turned the tide for the final time as they would score the next eight unanswered as used it to conclude the quarter with a 11-point lead, 63-52. The ‘Eaters went on to outscore CSUN, 25-22 in a major fourth quarter comeback that began with UCI going for 10 unanswered points to begin the frame and a Ritter triple—her only three on the night—that brought UCI within three, 65-62, with a little over seven minutes remaining. Even with the Matadors answering blow for blow with baskets of their own, the ‘Eaters kept chipping away. When CSUN took back a 75-69 advantage with under three minutes remaining, Glassow hit her final triple on the evening to bring the deficit back down to three once more. And despite their final rally, CSUN used their narrow lead to turn the pressure over to the ‘Eaters who couldn’t catch up in time, dropping the 85-77 decision. With the loss, UCI will have to wait until Saturday to turn their road trip around when they face off against the Cal Poly.